1. 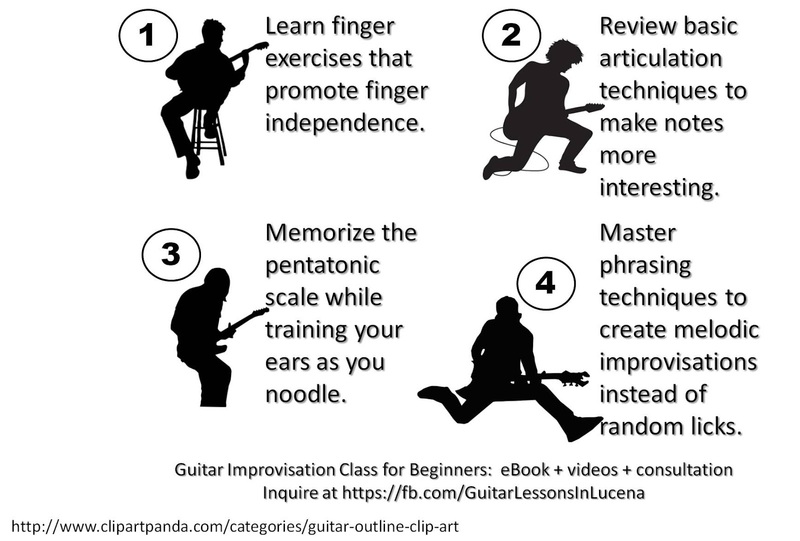 What is the Guitar Improvisation Class for beginners? This system guides you on what to practice to develop your guitar improvisation skills. Lessons are explained in the eBook along with suggestions on how to practice. Links in the eBook directs you to video demonstrations on the selected lesson. You can practice individual lessons at your own time and post relevant questions to the Guitar Improvisation Class group in Facebook. You can upload your video performance and receive useful feedback to help improve your playing. Other students can ask additional questions and learn from your post as well. 3. Who can benefit from this system? The best way to learn how to improvise is to hire a guitar teacher. However, most of you are busy with school or work and this schedule prevents you from availing the services of a guitar teacher. This system lets you study at your own pace and free time while receiving guidance from a guitar teacher. The system is initially available for only Php 800. This is equivalent to only a few hours with a guitar teacher. 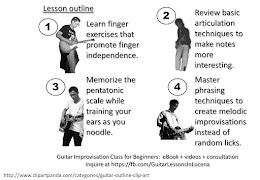 It is free to past students of https://www.facebook.com/GuitarLessonsInLucena. 5. Do I have to pay for updates? No. All updates are free to members. New versions may include additional lessons or updates to existing ones. Bank deposits will be the initial payment method. Paypal payment is available via Payhip. Other payment options will be available once I have set up my merchant account at an online marketplace. You may send a private message for the bank details at Guitar Lessons in Lucena. 7. What is the payment and membership process? Go to Guitar Improvisation Class and click Join using your Facebook account. Using the same Facebook account, send a message to Guitar Lessons in Lucena and include a copy of your proof of purchase. Your request to join will be approved after validation of payment. You may then download the eBook from the Files tab. 8. What is the proof of purchase? For bank deposits, your Facebook name should be written on the deposit slip. For fund transfers the reference number should be indicated. 9. Can I share my account with my friends? 10. Where can I post additional questions about the system? You can send a message to Guitar Lessons in Lucena for additional concerns.